Over 4.5 MILLION RACE FANS have used RacingIn.com to find grassroots race tracks and race dates across the United States! For Race Fans, RacingIn.com connects every race fan with over 1,200 race tracks across the United States. FOR TRACK OWNERS AND PROMOTERS, RacingIn.com is the ONLY FREE OR LOW COST PROMOTIONAL TOOL to promote your race dates to hundreds of thousands of race fans who use the site every year! It's a race track and speedway directory! 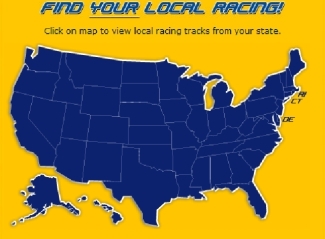 RacingIn.com is a national speedway directory and race track locator for the United States including more than 1,200 race tracks. Fans can find race tracks based on both TRACK LISTS for each state and by RACE TRACK MAPS that identify tracks along the highways and byways of the United States. COMING SOON.. A MOBILE FRIENDLY VERSION OF RacingIn.com THAT WILL PUT 1,200 RACE TRACKS IN THE PALM OF YOUR HAND! RACE DATES FOR FANS OF FAST! 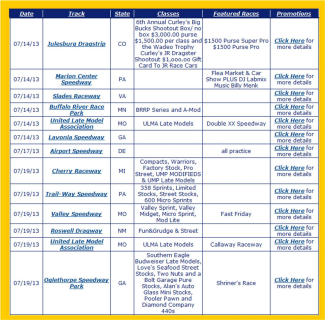 The MOST VISITED page at RacingIn.com is our Race Dates page. (CLICK HERE to get to it). 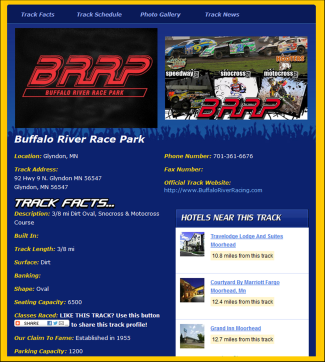 From this page, any race fan can find upcoming race dates and connect directly with the track. RacingIn.com is a promotional tool and race date distribution network! RacingIn.com is a low cost or even FREE promotional tool for any race track to use to make sure you are connecting with as many race fans as possible. Every track also has the ability to post as much information about themselves as they'd like including race dates, pictures, and more. FOR TRACK OWNERS/PROMOTERS: To learn how to make the most of YOUR track profile, just CLICK HERE to learn how to get your profile updated and your race dates posted. DID WE TELL YOU IT'S POTENTIALLY FREE!? With over 64,000 Facebook Fans (and growing every day), RacingIn.com is incredibly social. During the race season, our content posted on Facebook regularly reaches 50,000 to 60,000 people every week through social media! For Track Owners/Promoters: Once your track profile is complete and your race dates are listed, that's one more place for your races will be found! And Now: Social Media Targeting of Thousands of Fans within driving distance! Over the years, RacingIn.com has 'Figured Out Facebook' and how to make sure race fans see information about race dates near where they live and are traveling. Now, RacingIn.com can guarantee that your race dates reach thousands of race fans within driving distance of your track each week. CLICK HERE for more information on how just the value of 1 GENERAL ADMISSION ticket can increase the exposure of your race dates! So, there you have it... RacingIn.com in a nutshell... Now CLICK HERE to get to the home page and start exploring racing in your part of the United States! RacingIn.com is For Fans of Fast!